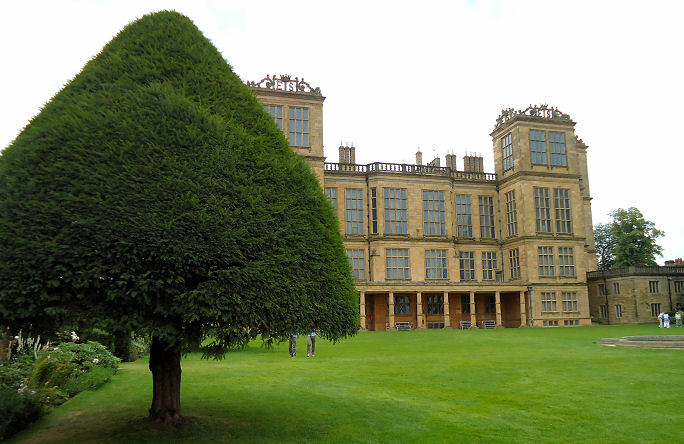 If I tell you that Hardwick Hall was built for Elizabeth, Countess of Shrewsbury then you might just guess it was hers by the massive statement initials E.S. which feature all over the top of the house. 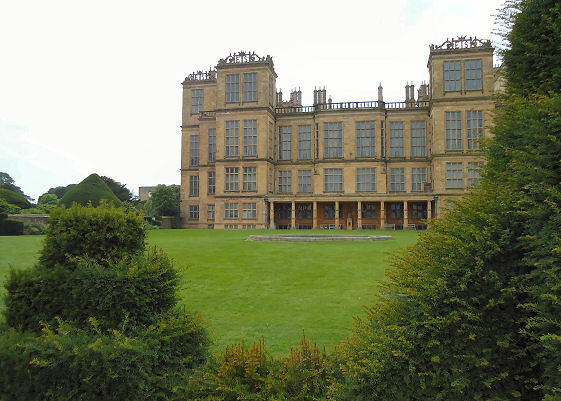 It was built by Robert Smythson in the late sixteenth Century and Elizabeth has gone down in history as Bess of Hardwick. The Hall itself is justly seen as one of the most significant Elizabethan buildings in England and shows the renaissance style which became prominent when rich landowners realised they no longer needed to fortify their homes now there was the rule of law under the Tudors. 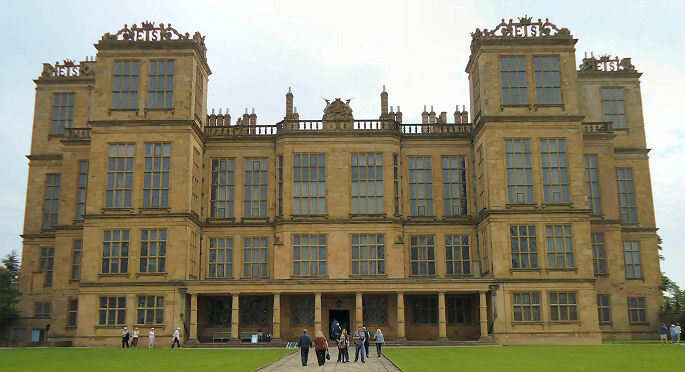 Glass at the time was expensive and showed your wealth and the front facade of Hardwick has been described as more glass than wall. Like most houses of its size and age the inside and outside have changed many times over the centuries but you will get a great idea how the gentry lived, slept and entertained if you take the full inside tour. Tapestries which would once have been colourful have now faded and that coupled with the wood paneling make it an austere house but then it was built to be imposing. Non of the present gardens are original as the area nearest the house will have changed many times over the years. It’s the gardens we have primarily come to see so I shall begin at the beginning. From the road to the car park is via one of the longest drives I have ever experienced in England. The vast landscape inspired parkland would have held deer and other livestock and grown crops for the family in the house. The car park is then quite a walk from the house but the National Trust have laid on an electric land train to take people with mobility difficulties to the house. You then walk through the stable block, which has the obligatory shop and restaurant facilities and then turn right and past the walled enclosure of the house’s main land. 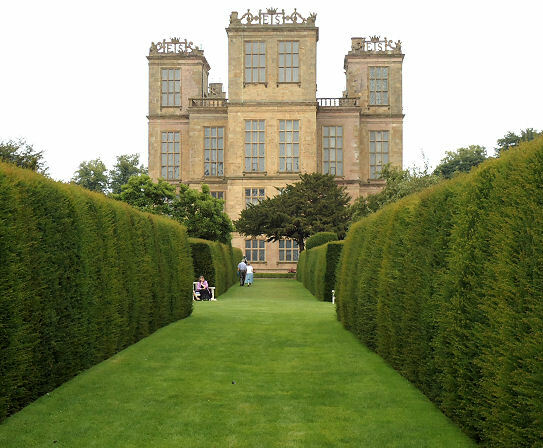 To the left on the path as you go you will see the Old Hardwick Old Hall. This semi ruin is administered by English Heritage. I say this as your National Trust ticket won’t allow you access to it. Bess lived here whilst the new house was being built. The main gardens within the wall, which are reached via a splendid set of gates, are separated in many sections. Some look quite wild especially the orchard areas. Perhaps I am getting old as the current fashion is now for wildflower meadows so what was once unkempt is now “natural”. 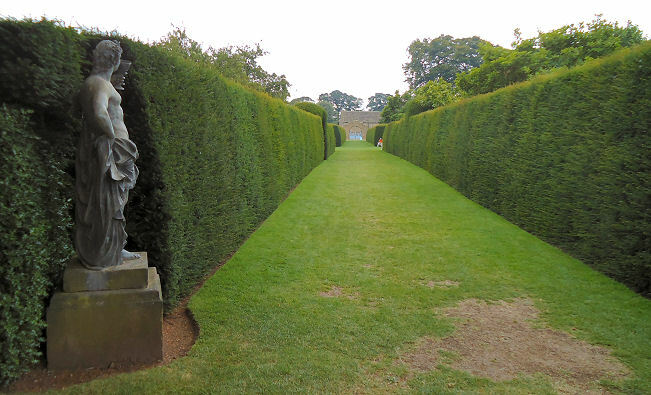 You can’t fault the yew avenues though which lead of in all directions and have a central crossing with four statues of women in artistic or warlike poses. These are set in arched niches and a curved low front hedge has been recently introduced to give them even more prominence. 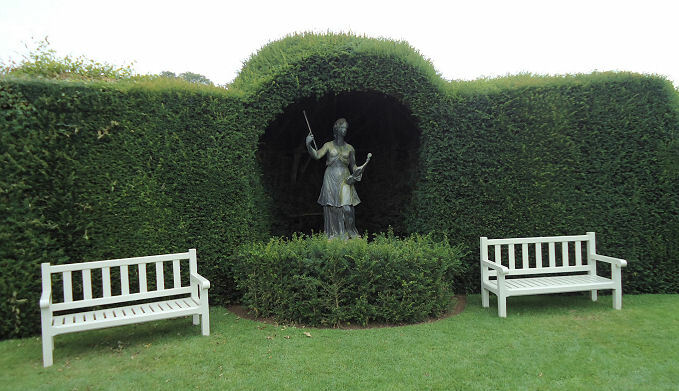 This is an ideal place to sit as there are several benches and you can image the historical ladies and courtiers wafting by plotting love and intrigue. The lawns to the rear of the house are a slight let down for such as house although if you found them in your neighbours garden you might well be impressed. Several yews have been left to grow for hundreds of years and have been cut into umbrellas and standards. There is also a new yew battlement flanking the edge of the garden before you go out to the ha ha which separates the formal from the livestock grazing land. One of the most impressive parts of the current Hardwick garden is the Herb Garden. It is massive and has enough plants and vegetables to feed and decorate a family of substantial size. 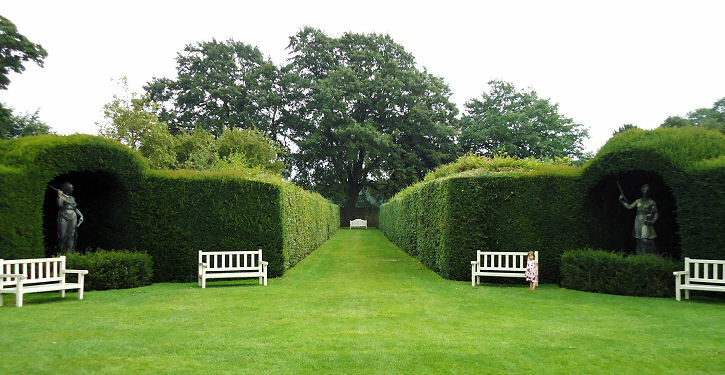 Each growing area is separated by box hedging but it is not a formal parterre but serves to punctuate specific growing areas in such a truly massive plot. Most grow your own practicioners would envy this garden on its own. Of course herbs were used as medicines during the period as well as for cooking and there are useful notice boards in the garden explaining the types of herbs which you can see and where they are located. 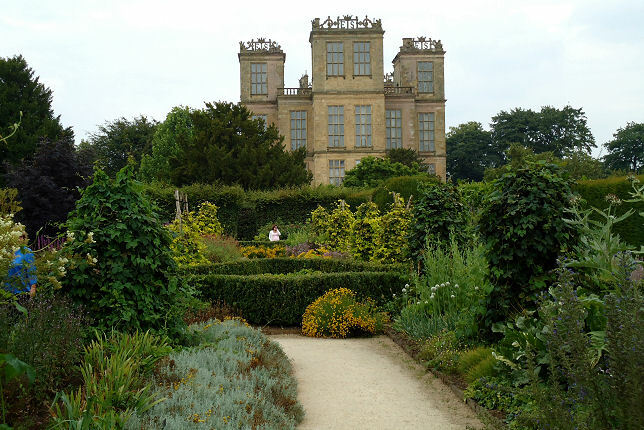 Give yourself half a day if you want to visit Hardwick and if you are feeling energetic a whole dayas you can also walk the many paths though the parkland to your heart’s content.